I’ve been getting scared lately. About Halloween. And it’s not by a ghost or a goblin or a vampire or a werewolf. It’s by my own stupidity. You see I am whatever is the opposite of a Halloween savant. For over 25 years Halloween was one of the focal points of my year. That’s because I had been a professional magician for that period of time. So back in Chicago, the two weeks prior to Halloween were two of the busiest of the entire year with parties for children, school functions and then the ones where people dressed up in ridiculous costumes and I had to do card tricks while I “guessed what they were” and inhaled vodka fumes. Those would be the adult parties. I don’t know how to get in any spirit or replace it. I always liked seeing the costumes and how the kids were so happy, but I worked and didn’t go to any parties. Every year I just dressed up as a magician. And even then I’ve always dressed casual, so it’s not like I had the tuxedo, top hat and cape. More like khaki cargo pants and some kind of orange shirt. Maybe it’s because I basically grew up in the biz it never really inspired me. See, in high school, I worked at a novelty shop that sold magic but it’s main focus was costumes. They made their money for the year in the latter half of September and October. The weekend for Halloween was a zoo! And I learned how to sell people all kinds of junk that would make this year “the best ever.” Told them how to apply the make-up even though I’d never done it myself (nobody came back to complain so I guess I read the instructions right) and up sold them on every costume. I’m not proud of it, but I was a teenager in the suburbs, so it was ridiculously funny to see “grown-ups” spend what I considered a small fortune at the time on one night. Or maybe it’s because I haven’t cared about scary movies since the ones in black and white: Dracula, Frankenstein, and of course, Abbot and Costello meet Frankenstein and the Wolfman. The only scary movie I can remember seeing in color is It’s The Great Pumpkin, Charlie Brown. It was implied scary, like Jaws. Don’t think it’s going to change this year. Zombies are big in Long Beach and they have this huge Zombie Walk. So maybe I’ll check that out. Or maybe just eat one of those Snicker’s in the shape of a pumpkin. those rock. At least I think my brain will finally get the date together now that I’ve blogged about it. As I’m sure my fellow bloggers out there will attest, it’s not real until you blogged about it. 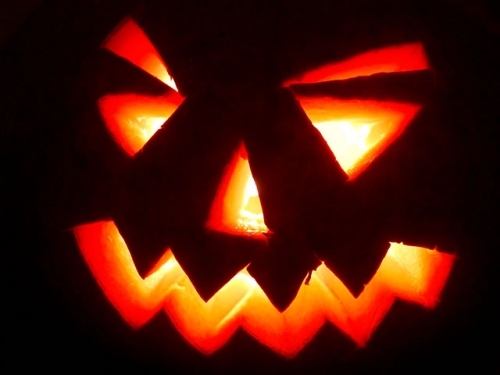 This entry was posted in Comedy, Humor and tagged costumes, Halloween, pumpkin, scary movies. Bookmark the permalink. agreed, it’s never real until blogged. ‘Snicker’s in the shape of a pumpkin’ ?! that sounds incredible!!! Those Snickers do, indeed, “rock”! Snickers was the first years back with the Easter eggs then every candy did it. But they’re still the best. The Christmas Nutcracker soldiers are great too. Snickers anything is my favorite. Snickers cough medicine would be awesome. I also like the Reese’s Peanut Butter egg (I think they have branched out into a Christmas tree and a Pumpkin). Reese’s Christmas tree is second place.